Clogs! // Interview with Maria of CHICISIMO!!!!!!! Many of my dear readers are familiar with Chicisimo.com (I'm sure!) Maria the founder of the site, was kind enough do to an interview with me. Enjoy! Mouthwash:Chicisimo is such a wonderful accomplishment! It's quite an astonishing feat, really. About how many hours a week would you say you spend updating it? Maria: Well, that's not easy to respond to. 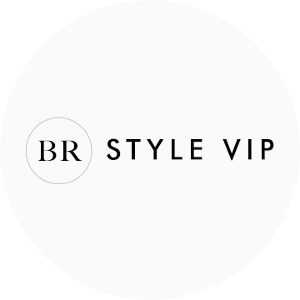 I am quite adicted to personal style blogs, I love them, I love personal style pictures, so I spend a lot of time visiting blogs and enjoying new styles. I update Chicisimo in between those visits. I spend all my day doing this. I love it! Mouthwash: Does anyone help you with Chicisimo? Maria: Yes! I started alone back at the end of 2008 in San Francisco. Not long ago, my hubby started helping me: he's the geek one in the couple, I love [the] fashion. Mouthwash: From all the outfits you see from week to week, are you seeing a favorite trend of the moment? What catches your eye? Maria: Good question! Chicisimo is just a reflection of the personal style community and therefore we see all kind of trends. We can't forget these girls are true fashionistas and a lot are beyond trends: some wear the latest trends, others wear what will become trends in next seasons... What is important is to be happy with your style, and I see a lot of that - also summer dresses worn now in winter. What catches my eye? Diversity! I love to see girls trying new things! Mouthwash: Do you have a(ny) favorite designer(s)? Mouthwash: Tell us 3 items in your fridge that you couldn't do with out. Maria: Fruits, vegetables and cold water are my 2010 resolution. But what I truly love is chocolate, cockies, icecream, coke and candy. The problem is: I cant control myself with this stuff! Mouthwash: Would you be willing to give a snap-shot of the must have items in your purse? ie, items you couldn't leave the house without? Maria: My wallet and keys are the two only items I always have with me. I don't take my sunglasses, or make-up, or brush. I can't even remember to take my cell with me. I'm a disaster!!! Mouthwash: What's some of the music you are listening to now? Maria: I listen to all types of music, but I'm lately listening a lot to Madonna, Alejandro Sanz, Shakira, old songs of La Oreja de Vangogh and Michael Jackson. And you'll laugh, but having the little girls (3, 4 and 5 years old) Twinkle, Twinkle Little Star and similar songs are part of my everyday life. Mouthwash:Thank you so much Maria for taking the time to do an interview with Amber's Mouthwash! 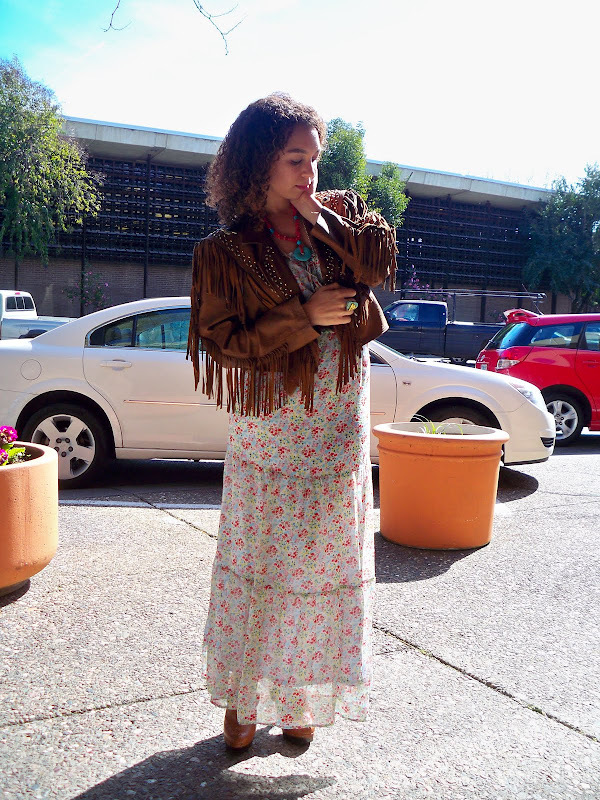 Vintage leather fringe jacket and clogs, turquoise Buddha ring, Gap dress. gorgeous pics! love that dress! I love your outfit the idea of fringe with florals is an amazing idea. The interview was great as well although I don't always have what I would like in the fridge I would love to have a tonful (if that's a word) of vitamin it is so juicy, refreshing and gives me so much energy! I'm ridiculously jealous that you have the weather for such lovely airy outfits. You SO suit maxi dresses, right down to the ground. You should really wear them every single day, though that could get a little bit boring!Love the florals with the blogs as well, and the fringed jacket! Gorgeous maxi dress, id love one but im too short for one! the dress is so pretty! i like your clogs too, i just got a pair myself. The return of clogs!! I've seen a lot of great clogs in Zara, now I'm thinking about buying a pair of them. She is so fabulous and I am SO diggin' those clogs! How lovely ! I love Chicisimo , great website :) And anyway I love your outfit ! What a lovely dress ! Your clogs are fabulous but I especially love that jacket! Gosh, I adore those clogs, I need them, I want them!! Your outfit (and weather) look beautiful! I don't normally go for the fringe but it's so good with that dress! Nice dress. I like how you match it with your necklace! 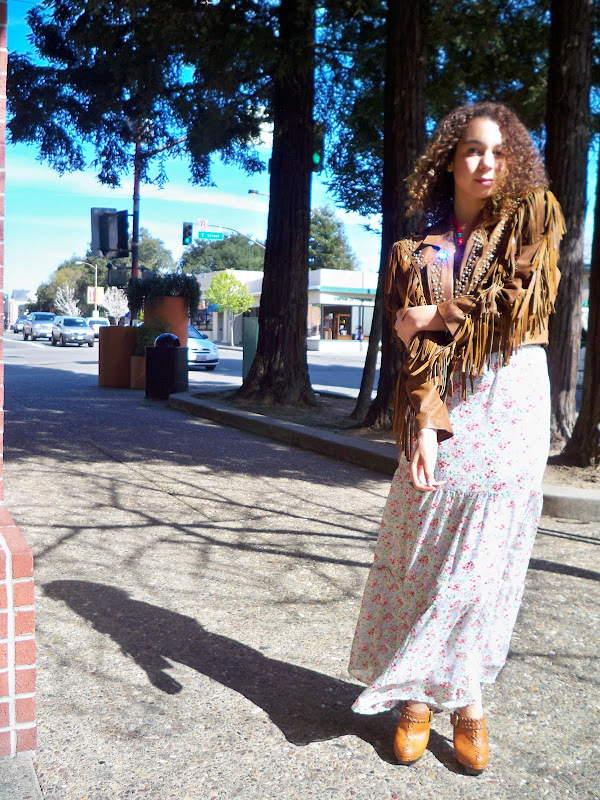 i love LOVE that fringe jacket and your dress! you look so gorgeous and i love this sunny photos! 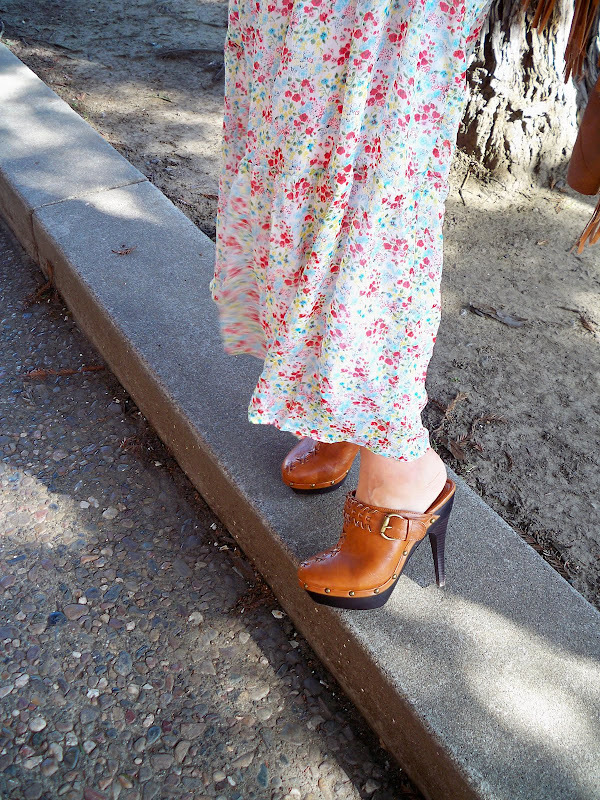 love your maxi and shoes! Hi Amber, thanks so much for such a sweet interview and for taking the time to do it. Really appreciate it, you are awesome!!! I'm sending you an email very soon. 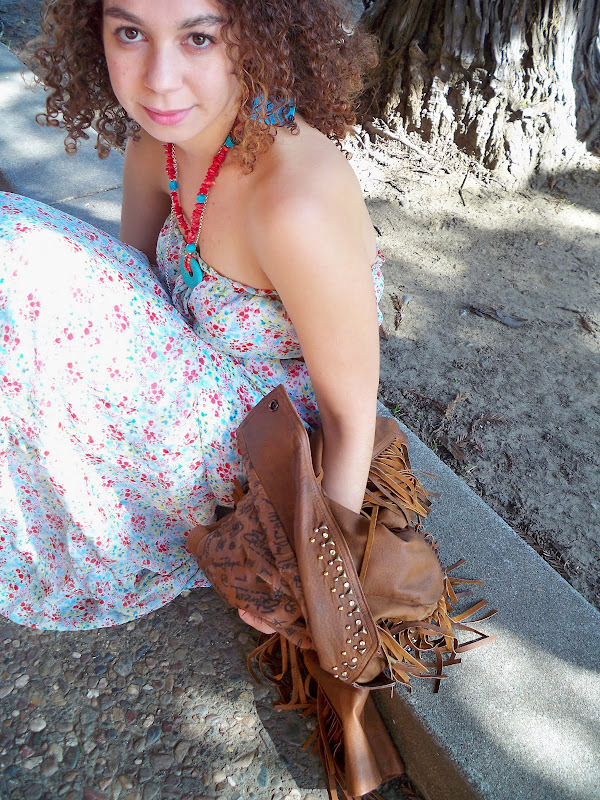 Just came across your blog for the first time and I love your jacket it is totally amazing and the dress is soooo cute! Also do you have a stand/tripod to take your pics? They look great. Or does someone take them for you? Im thinking I should invest in one. beautiful dress and cool clogs. I'm desperately waiting for mine!! what a gorgeous look! love the dress so much - so romantic and feminine and the clogs are awesome!!! you really pull this dress off great! Love your jacket!! . Like in pocahontas ;)) Cute outfit. i love love love your jacket!!! really like the dress. interesting interview!